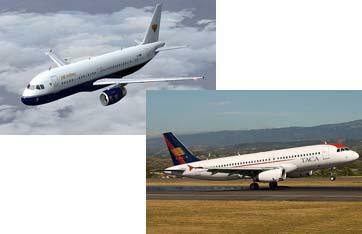 The A320-100 and A320-200 are the 2 variations of Airbus A320 series. Only 21 A320-100s were ever made; first to be developed, were given only to Air Inter (an airline later on bought by Air France) and British Airways The A320-200 highlights wingtip fences and improved fuel capacity over the A320-100 for improved range; other than that differences are just minimal. The 737-800 is the direct Boeing competitor for this aircraft.